Meet our new team member, Amy! Born and raised in Vancouver, Amy has fostered a deep love and respect for the amazing nature surrounding the city. She previously worked as an Archaeologist/Program Coordinator for a North Vancouver First Nation and spent many years helping to protect the cultural health of the community. 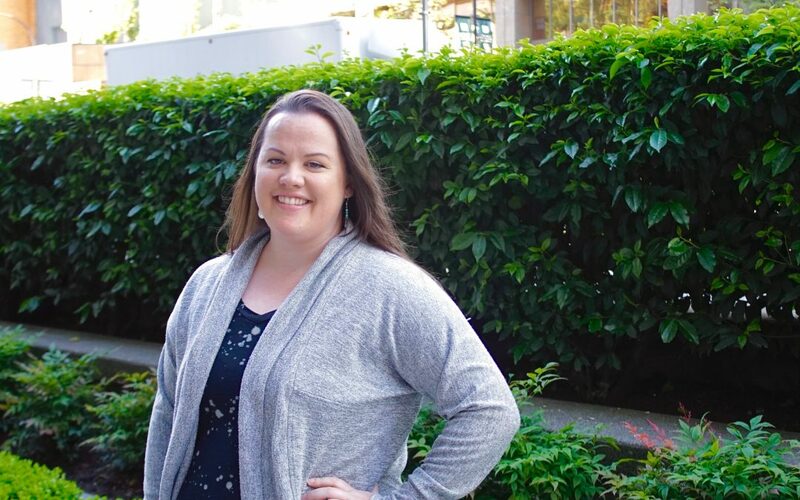 Expanding on her Bachelor of Arts – Archaeology degree obtained from the University of Saskatchewan, Amy is currently completing the Associate Certificate of Project Management Program at BCIT. Amy enjoys running through the trails at Lynn Headwaters, playing ultimate frisbee, reading legal thrillers and making/restoring furniture. Endless possibilities! I’m very excited to be joining CMG at a time of exponential growth and expansion for the Strategic Engagement & Communications practice group. The backgrounds and prior work experience of the team enable Castlemain to approach any project with a holistic view and various expertise areas. This capability means that our team can bring unique strengths to any project in our portfolio. Personally, I’m thrilled to have the opportunity, over time, to manage many different types of projects all over Canada. In my previous role, I was an Archaeologist and focused on the archaeological aspect of projects. That work took place primarily in the British Columbia, Lower Mainland, and Fraser Valley. It is a refreshing change to have the chance to work for clients throughout Canada. It will be challenging to move between CMG’s practice groups and their various projects but I am excited about the new opportunity! I feel it inappropriate to define reconciliation from a settler perspective when the majority of Canada’s First Nations are completely unheard. Instead, I will draw on my years of experience of working with and learning from First Nations to discuss my views of what the Nations would like reconciliation to look like. I have been taught that real reconciliation will occur when First Nations can experience healthy lands, waters and cultural health of their communities. Key factors are the ability for these communities to conduct traditional activities such as hunting, fishing, and ceremony without the fear of interference from local, provincial or federal governments; and, the ability for First Nations communities to control their own lands and resources. Most of all, reconciliation needs to recognize that the First Nations are an integral part of Canadian history who, although they have been treated abhorrently, are still willing to come to the table with strength and resilience to discuss how colonial Canada can right their wrongs of the past.